January: and a time for taking stock, of course—doesn’t it often seem the mind and the heart share a sad tropism, bending not to joy but inevitably toward that dark sun of loss, the shock of betrayal, recalled moments of strife and, yes, despair? (And always worse this year than the last – although this might be more fact than feeling regarding 2017.) So it is with me, anyway. Personally, and now professionally. For it is with the greatest unhappiness that I – we at Plume – face just such a disconsolation: saying goodbye as we must to Adam Tavel, our brilliant, stalwart book reviewer these past couple of years. Adam, as his December Facebook post suggests, has been a busy man, reading god knows how many collections in his 24 months, mining what gold there was, always honest, never unkind, open to every poetics, heedless of stature or reputation. After two years as the reviews editor for Plume, I’ll be stepping down at year’s end, having reviewed 38 books over the course of 24 consecutive issues as the magazine’s resident critic. My December review will be my last and publishes this weekend. 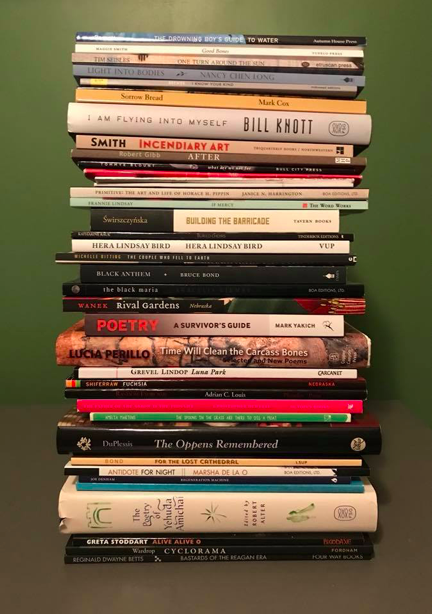 I’m forever grateful to Daniel Lawless for giving me this opportunity, to Nancy Mitchell, for encouraging me, and to all of the marvelous poets and publishers who shared their work. After taking this self-indulgent photograph, I turned to find my toddler pumping lotion on the carpet—fitting symbolism that my time has come. How we will miss you, Adam! On to other things – those kids of yours, your lovely wife, your students, but most of all, now, time to devote to your own marvelous writing. We wish you every good fortune, and be assured I will take you up on your offer to guest review or edit in the future: you haven’t heard the last of Plume. If You’re In The Neighborhood Department: A reminder that Plume soon will become part of the (indoor!) Bryant Park Winter Series; our date is Tuesday, 16 January 2018, at 6pm. The four poets reading will be D. Nurkse, Rachel Hadas, Jessica Greenbaum, and Tom Sleigh. Bundle up and stop by if you can – that’s quite a lineup! Because of winter temperatures, the readings will take place at Kinokuniya Bookstore, 1073 Avenue of the Americas; located on Sixth Ave between West 40th St and West 41st St. The program begins at 6pm. After the reading the poets and their plus one move to Saju Bistro, 120 West 44th St, just West of Sixth Ave.
Penultimately: As noted, for the launch of our annual print anthology Plume Poetry 6, we will host readings on 7, 8, and 9 March 2018 at AWP, early evening, probably 7:00 – 9:00. We have a beautiful venue – the Aloft Hotel – with as promised a bar/restaurant in the same building, to which we can repair and chat away after the programs. I very much look forward to seeing as many of you there as possible. More information on the Plume Booth # and other assorted matters next month. Nota bene: some rearrangements and additions of readers might be forthcoming, but the rosters above are reasonably predictive. 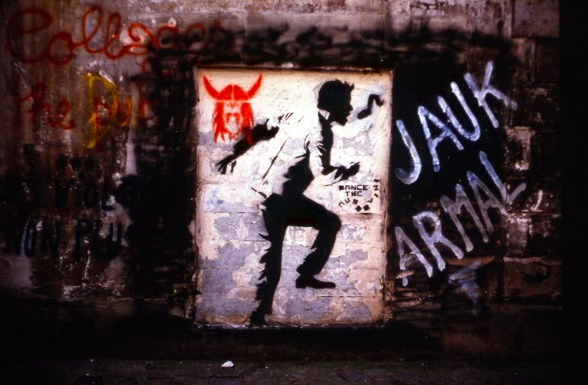 Last: our cover art this issue – an old favorite, Blek Le Rat’s “The Running Man / L’Homme Qui Court”; Paris 1984, pre-Banksy. For more on this seminal graffiti artist (born Xavier Prou) see, to begin, http://bleklerat.free.fr/ . Berdeshevsky, Schwartz, Lindsay, et. al.